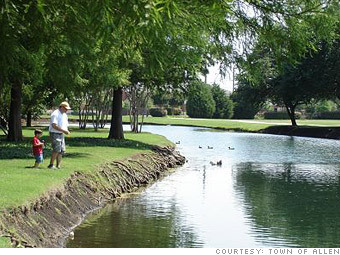 This town is a 30-minute drive from downtown Dallas, so it's no surprise that many residents work in the big city. When not at the office, they have plenty to do right at home; Allen has a symphony, a ballet, malls, and even its own minor league hockey team. Parents appreciate the top-rated school system and low crime rate. Their children appreciate MTV-featured "The Edge" -- one of the largest outdoor skate parks in the nation. --J.S. Is Allen a great town, or what?